the other is there to help them heal. On this side of the world, it was a beautiful Saturday in Hays, Kansas. It had been warm, but for August, that was nothing new. As the sun begins it's decent over the western horizon, the heat gives way to welcome the cool summer night air. It's August 6, 2011, the sixty-sixth anniversary of the bombing of Hiroshima, at the tail end of World War II. But on this day, the bombing did not come from America. It came from another evil. An evil which no one understands. On this side of the world, there is a ten-year-old boy playing in his room. He doesn't want to go to bed just yet. He's just sitting on the floor playing with his toys. On his dresser is a picture of him and his Dad. It was taken the last time they went camping together. His Dad is half a world away, fighting for our freedoms. But this little man, does not understand what freedoms are all about. He just knows that his Daddy is a pilot who flies Chinook helicopters for the United States Army. The telephone rings, but he thinks nothing about it. He lives with his Mom, after his parent's divorced. His Dad married someone else and they all get along. "Braydon, do you know how much your Dad loves you? Do you know how proud of you he is?" she says. What about his Dad? How come they won't talk about his Dad? He was the pilot...why won't they talk about him? "My father was one of the thirty U.S. Soldiers killed in Afghanistan yesterday with the SEALS rescue mission." tells 10 year-old Braydon Nichols via website form to CNN. "My father was the pilot. I have seen other pictures of victims from this deadly mission and wish you would include a picture of my father..."
It's the hum of the tires as they move across the pavement mixed with the hum of the motor in the tour bus that can make a person fall asleep. For some it's music to one's ears. Nonetheless, when you have traveled down the roads of America as long as they have, the sound just fades into the environment of life on the road..
"Guys? When is flag day?" calls the bus driver. "Isn't that in June?" says one of the guys. "I'll look it up... June 14th...Why?" says another. "Take a look..." replies the driver. All four members of the band stop what they are doing, move to the nearest window to see what the driver is talking about. There are thousands of American flags that are lined along this rural Kansas highway that they are traveling on. "What's today's date?" someone asks. "August 12th..." replies the driver. As they near the town of Hays, the flags continue. They are stuck in the ground, as if they were planted like the green grass that surrounds them. The streets are lined with people, eagerly watching and holding flags that they proudly grasp within their hands. It's a sight that none of them have ever scene before and may never see again. They know within their hearts that this is not for them. The faces of the people that line the streets are the faces that are filled with youth and also with wisdom. For there is no one age group that line these streets. Within the crowds of people they see sadness, mournful looks and yet pride. What was going on in this quaint little town? "Maybe not even a couple...I'm not sure how far we were ahead of it. It wasn't that very far. We didn't know what was going on...we were basically thinkin' this sure is odd. It's not Memorial Day; its not July the forth and we didn't know what was going on." shares Duane Propes of the band Little Texas. "We got down to the Ellis County Fairgrounds and the promoter met us... the first thing we did was jump off the bus and ask 'what in the world is going on?' 'Oh, we had a home town boy that died in a helicopter crash and they're burying him today.'" The band soon found out that they were just mere miles ahead of the funeral procession of Army Chief Warrant Officer Bryan J. Nichols. CWO2 Nichols was a pilot and one of thirty-eight soldiers who died in a helicopter crash on August 6, 2011. Nearly every resident in Ellis County turned out to pay their respects to their home town hero. "How the whole county turned out all the way down the road... It was literally five or six miles down the road, this was going on. For a small county like that, you just don't see that any where. But, everybody's just lined up along side of the roads, with American flags and all that..." tells Propes. "With just a little bit of research and at that time there wasn't a whole lot there. We asked a lot of people that day about it and got a lot of information. So we wrote the song and then later on went to meet his family, two years later." 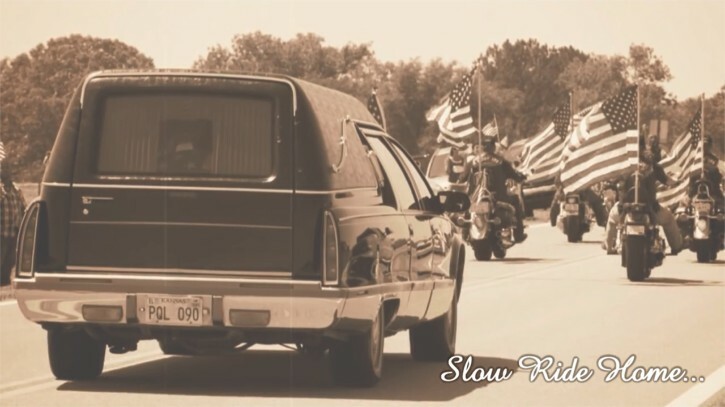 Duane Propes, Dwayne O'Brien, Poter Howell and Del Gray; who make up the band Little Texas, were so moved by the residents of the town of Hays and Ellis County that they honored them and the memory of their home town hero with a song called "Slow Ride Home." The heart of the lyrics rides a gentle but powerful melody that captures the soul of this Fallen Soldier as he is brought home. Shortly after the song was recorded, Little Texas knew they could honor the sacrifice of CWO2 Nichols with a video that will accompany the song. The band requested the help from his family and the Hays Daily News, the local newspaper, to aid in the production of the video. Both parties were honored as they shared photographs of CWO2 Nichols and the effects he had on his home town. The video can be viewed on our website. Since they wrote the song, Little Texas has added it to their play list in live shows. "Every night. Since before we recorded it, we've done it every night." shares Duane. "The first thing we do is ask for the Vets to recognize themselves and make sure the crowd gives them a huge round of applause to give 'thanks' to them. Then we do the song... but the biggest thing is recognizing those people that have been there. But yeah, every show." 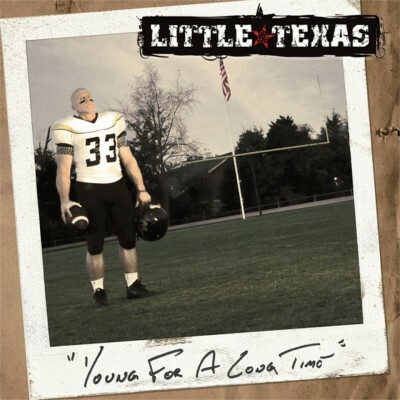 In 2015, Little Texas released their latest album Young For A Long Time. The album features thirteen cuts including "Yeah Yeah Yeah," "Kings of This Town," "Nothin' You Can Do," and the title cut. The band also brings listeners back, with the addition of their signature song "God Blessed Texas." Additionally, the album features two songs that will be added to our list of Top Songs of 2016 and will earn a nomination each for the Spirit Award's Song of The Year Award. The first is "Take This Walk With Me," a beautiful love ballad that should be considered for any wedding ceremony. "That one is something we can't do live..." shares Propes. "Because none of us can get through it. It's such an emotional song. It was written about our wives, our kids and our families." The second song, from this album, to hit our list is "Rednecks Do Exist." This is one of two light hearted songs that the band includes on this project. Classified as an obscure song, this one is certain to tickle your funny bone with it's unique lyrics. As good as both of those songs are, the centerpiece of the album is "Slow Ride Home." This song will be included on our list of Top Songs of 2016 and earn a nomination for The Spirit Award's Song of The Year Award. But it is due to this song that The Spirit Awards have added another category to the list of awards. "Slow Ride Home" is the first song to earn the nomination for "The Spirit of America" Award. Only songs classified and chosen as Songs For Soldiers are eligible for this award. Fans can vote for these awards come December. 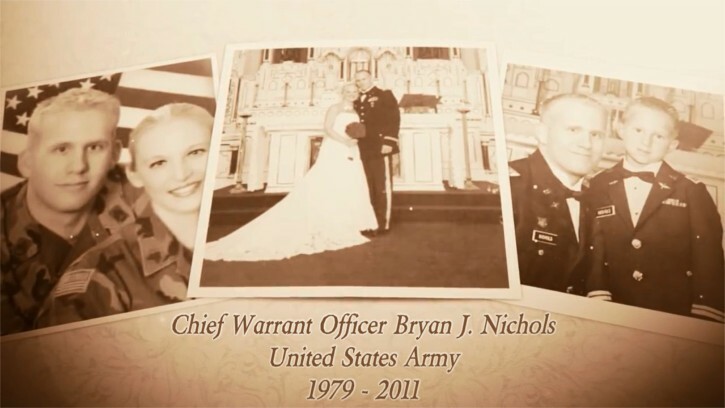 Bryan Nichols was born a military buff. He followed in his fathers footsteps and enlisted in the Military prior to high school graduation. With hard work, he rose up the Military Ranks. His service records report that he did two tours in Iraq and one in Kosovo. He went on to pursue his passion for flying and graduated from flight school. "What he stood for is what we all stand for. We're very proud of him," shares Vietnam Veteran and Bryan's father, Doug Nichols. "I stood up and went to Vietnam, stood up for my country there. He stood up for his country, and we're proud of him. He's a true patriot." Five years ago; a world filled with sorrow, hurt and pain collided with another world filled with strength, honor and compassion. Some say it takes a village to raise a son. But in a small part of this side of the world, the village said 'good bye' to a son they will never forget. A little boy is now becoming a man. Five years ago, he asked why they were not talking about his Father. It is for the sake of his love for his Father that his story flew across the world, as his father flew to heaven.